A recent field trip down the western side on Penobscot Bay to Portland convinced me that although the weather outside has been frightful, the longer days of spring mean more Maine produced food. Chickens and ducks are laying, hoop houses are filled with tender greens and tomato seedlings, goats are kidding, cow are calving, cheese is aging, cider vinegar is being bottled, and pansies are blooming. For dedicated localvores, the season between root vegetables and when the garden starts producing can be culinary challenging. A visit to a farmers market changes all that. Smelling freshly baked breads, sampling local cheeses, admiring cultivated mushrooms, tasting micro-greens grounds me, and inspires me to cook. 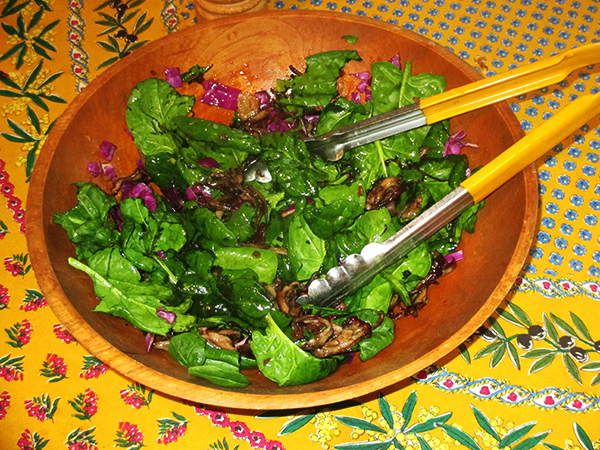 The recipe for Spinach and Warm Mushroom Salad is from my archives. This easy to prepare salad is a delicious way to enjoy some of the varieties of cultivated mushrooms that are popping up at the market, plus Maine-grown seasonal greens, Maine maple syrup and apple cider vinegar. Eating mushrooms is good for your health, as they are a fine source of B vitamins, including riboflavin and niacin, which are important for maintaining healthy red blood cells and good digestive health. They are one of nature’s most versatile foods, and can be used in hundreds of ways, both raw and cooked. In this recipe, the meaty mushrooms are sliced and sautéed with red onion or shallots and bacon bits. By deglazing the mushroom-bacon pan with apple cider vinegar and maple syrup, you create a sensually warm and savory dressing, that when tossed with a wide variety of local “greens” becomes a very satisfying salad. Mushrooms are one of the few sources of naturally occurring Vitamin D….the vitamin generally associated with sunlight, because the body can actually synthesize Vitamin D with the help of sunlight. 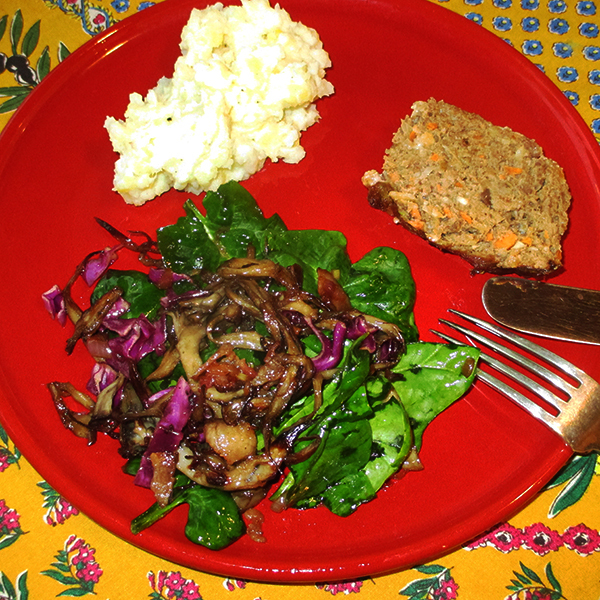 Research indicates that those who consume mushrooms have the healthiest and most sustainable diets. Way to go ‘shrooms! Add chopped boiled eggs or grilled chicken to this hearty salad to make a meal. Wash the greens and, if needed, tear them into bite-sized pieces into a salad bowl. 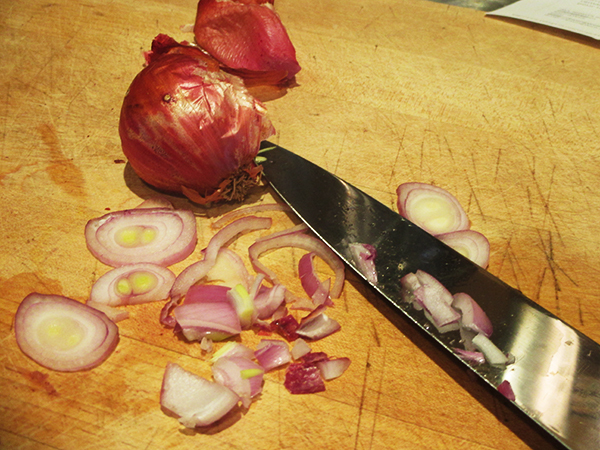 Chop the red onion or shallot. 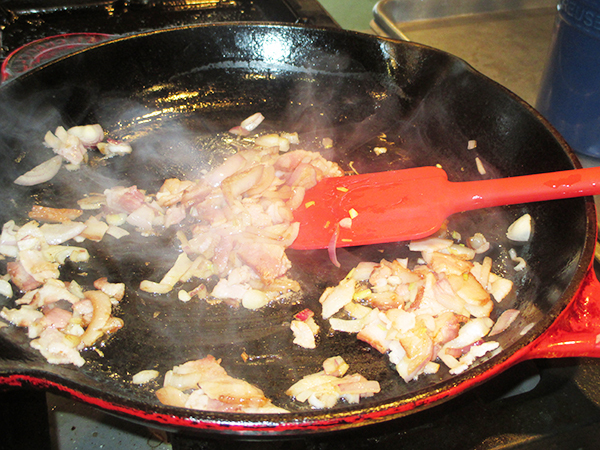 In a large skillet, add one-tablespoon olive oil and the chopped bacon. 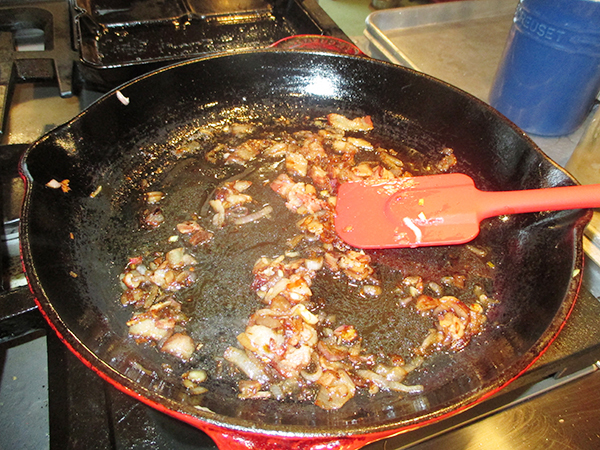 Cook over medium heat until the bacon starts to sizzle. 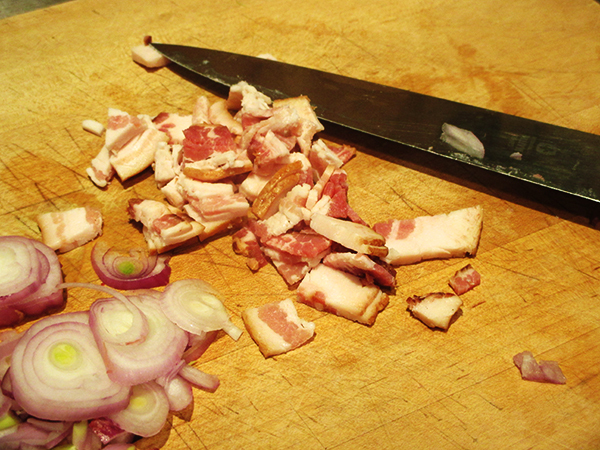 Add the chopped onion or shallot and cook until the bacon is crisp, about 5 minutes. Add the sliced mushrooms, stirring and cooking until the mushrooms are tender. Remove the pan from heat. Add the remaining 1-tablespoon olive oil, apple cider vinegar and Maine maple syrup, scraping the pan to remove all the caramelized bits. Season the cooked mushrooms to taste with sea salt and fresh pepper. 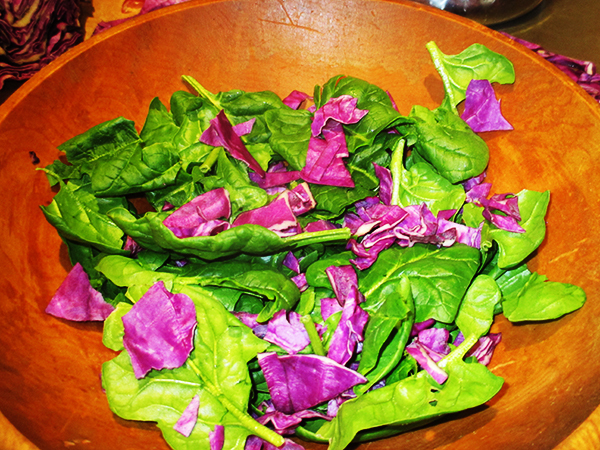 Pour the warm mixture over the salad greens and toss well to coat. Serves four. Nutritional analysis per serving: 161 calories, 8 grams protein, 7 grams carbohydrates, 12.6 grams fat, 205 mg. sodium, 6.3 grams fiber.